This article originally appeared in the September/October 2015 issue of Fanfare Magazine. Copyright © 2015 by Fanfare, Inc. Used by permission. 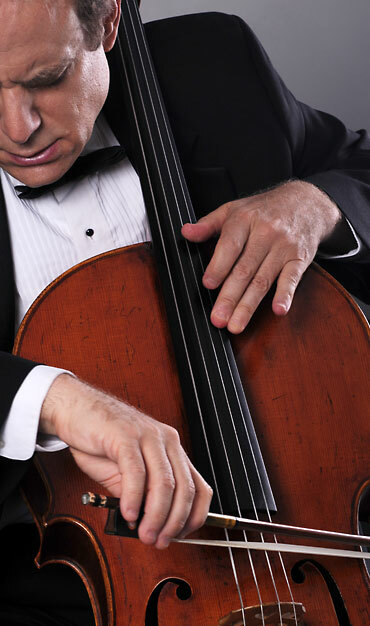 The American cellist James Kreger has been a figure on our musical scene for several decades. A Tchaikovsky Competition laureate, he has a large repertoire of chamber and solo music for his instrument, numerous concerto appearances to his credit, an interesting variety of commercially available recordings, and he is a member of the Metropolitan Opera Orchestra. However he is known to another vast audience as a result of the Internet and what is referred to as social media. Many of James’s performances are posted on YouTube and listened to by thousands. As I write this, he has 5,000 Facebook “friends.” At the time he and I “friended” one another, some four years ago, that number was, if I recall correctly, under 4,000. So, his exposure has increased steadily. If I may make a personal comment, James, you use your Facebook “wall” as a force to promote music: to expose your Internet audience to music, performances, recordings, and events of both current and historical merit. Tell us about this, how you began those activities and also your interests and motivations. Thank you! Some years ago a colleague urged me to establish myself on Facebook. Initially I felt uncomfortable, due to all the negative publicity about privacy issues. Another old musician friend actually “friended” me, if memory serves, or at least invited me into the Facebook universe. From that moment it took me an entire year before I decided to take the plunge. I remain happy I made this decision. A friend once photocopied the entire Furtwangler on Music book and gave it to me as a present. Several years ago I became distraught when I had misplaced it. No amount of searching turned up the book. Of course, it’s probably still lying around somewhere! Well, I couldn’t wait any longer. I had to see the book, so as we know there’s nothing like the Internet to find what you’re looking for and then some! I found the book and paid a pretty penny for it as well. During the 1960s Alfred Wallenstein was one of the conductors for the AFM Congress of Strings. Along with Feuermann and Piatigorsky, he was a student of Klengel and at one time was the very great principal cellist, along with concertmaster Mishel Piastro, of the New York Philharmonic under Toscanini, and he performed under Bruno Walter as well. Piastro, a student of Leopold Auer at the St. Petersburg Conservatory, made his Carnegie Hall début in 1920 and had toured as a soloist with Glazunov, performing the composer’s Violin Concerto with the latter on the podium. During the 1921–22 season, Piastro was chosen by Richard Strauss to perform with him in sonata and trio concerts on the composer’s only tour of the United States. On April 7, 1932 Wallenstein, Piastro, René Pollain (viola), Thomas Beecham (guest conducting), and the New York Philharmonic made what was to become a legendary recording of the Strauss Don Quixote. In the summer of 1964, during the Congress of Strings sessions, Wallenstein conducted the orchestra; Mishel Piastro also conducted and was a member of the faculty, as was Theo Salzman, student of Julius Klengel and principal cellist of the Pittsburgh Symphony under William Steinberg (1952–1976). Salzman, who made his début in Pittsburgh in 1954 at age 18, had been solo cellist of the Vienna Symphony in his native Austria and for 11 years played there under Richard Strauss. One day after a rehearsal, Wallenstein invited me to his hotel to play his Strad cello. One thing he told me above all stuck: “Listen to as much Lieder as possible.” That summer, when I performed the Brahms C-Minor Piano Quartet, op. 60, Salzman lent me his Gofriller cello for the occasion. Piastro related some special, inspiring commentary about the grandeur and lyricism in the slow movement with the famous cello solo. That performance of the Brahms, fueled by the multiple realizations and inspirations from Wallenstein, Piastro, and Salzman, turned out to be a defining moment in my life, although I probably didn’t realize it at the time. When Wallenstein urged me to listen to as much Lieder as possible, I did that and more. Already thanks to my great uncle, a poor, Russian-Jewish bookbinder, I learned about the weekly Met Opera broadcasts. Without fail every Saturday afternoon “Pop” had the radio on in his tiny pine-paneled bedroom in my Uncle Henry’s house. The music was intoxicating and addictive and everything else you could possibly imagine! That was my entrée to the Met. When Wallenstein urged me to listen to Lieder, it took time to realize what he meant and just how important it is for any musician. The Lieder singer has no costume, scenery, etc. to lean on, as one would in the opera. For the Lieder singer everything must be produced by the voice alone, and that includes, but is not limited to, telling a story, building and contrasting characters, spinning out a musical line, acting, drama, etc. That concept of everything emanating from one’s sound would become the most important connection for me in music. It would apply to any playing I would do from then on. It seems to me we are in a dichotomy today, in that the technical training for instrumentalists has never been better, but the opportunities for general musical education, what used to be called “music appreciation,” are extremely limited by funding cuts—a seemingly universal situation. Your thoughts—perhaps you do not agree with my assessment of the technical level of young performers? Great music touches the emotions in an unforgettable, life changing way. One doesn’t need to be “educated” to appreciate and be moved by great music. One simply needs to be exposed to it. On the other hand, when I learned that Mayor Rahm Emanuel had instituted obligatory fine arts education in the Chicago public school system as an experiment, I couldn’t have been happier. To the best of my knowledge New York, our largest city, has yet to bring back the arts on a grand scale, and it should for the sake of all concerned! Virtually from the beginning of time history tells us the future of mankind and civilization on this earth has one hope—the arts. And the greatest of these is the universal language of music. Now, back to “technique” and “general musical education.” It’s true that music goes straight to the gut, the emotions. When it communicates, potentially it can lift us up and transport us to another time and place: a cosmos of emotion and color. A wall, which usually has two dimensions, becomes a door opening onto infinite dimensions and layers—a universe of worlds, a world of universes. Anyone can experience this magnificence, this grandeur, with absolutely no “education,” unless of course one equates “education” with “exposure.” So you ask, what’s the key? The “key” is “technique.” Of whom, where, what? It’s up to the performer, the player, the one who sends the music out. If the signal is true and honest, it can reach infinity and that means just about anyone … anywhere. Here’s where words become useless. One would think that a strong signal should reach deepest, but not necessarily. The “sound” is the “signal.” “Sound” has layers, dimensions, colors, and ever so many more qualities. But here’s the important thing: Sound has no meaning. It just means itself. But, it does have a certain quality that can and often does elicit “meaning” in the beholder, the listener. You had the benefit of work not only with various cellists, most notably your mentor and teacher, Harvey Shapiro, but also exposure to a great number of musicians (including Serkin on piano, Casals on cello, and Szigeti on violin), who coached and critiqued. I recall you were at Marlboro, and also had opportunities for what we might call “postgraduate” work in Europe. But really, those were performance opportunities, real music-making. Those influences take the technical expertise and meld them with artistic development, do they not? Playing chamber music is the most wonderful thing about being a musician. It is the essence of music and music making. Even if one is not playing “chamber music” per se, one still is playing chamber music! No matter what one does, be it playing as a member of a string quartet, or of an orchestra, or even as a soloist, at one’s absolute best one is always playing chamber music. The “chamber music connection” is what ultimately elevates any musical performance to its highest level, including in the orchestra and opera. When the right combination of players gets together, wonderful things can and invariably do happen. In the orchestra, depending upon which players one is sitting next or near to, chamber music and consequently magnificent music-making often transpires. Players feed off each other as it were. It doesn’t matter if they are sitting near each other though. When one hears beautiful, inspiring playing from another player sitting on the other side of the orchestra, chamber music dialogue can still be triggered. The great conductors find a way to “invite” the orchestra to join them in what is essentially chamber music in the best sense of the word. A conductor must never get in the way of the players’ natural sense of listening to each other, “singing” a musical line or other maximum expression. The minute a conductor inflicts his will upon an orchestra or tries to stop/crush the natural group emotion, or, God forbid (! ), the orchestra’s own internal group pulse, disastrous results may occur. I remember a famous conductor once discouraging “Romantic expression” in the orchestra. Loud/soft, fast/slow, etc. was fine, but “emotion” to him made the music sentimental, which he wanted to avoid. Unfortunately, the final result was nothing but boring. Often some players think they like a conductor very much, because he lets them play but discourages what he calls “sentimentality,” only to realize later they haven’t made music at all. They feel very “comfortable,” but that’s about it. Usually when music has been made, people in attendance feel it. The most important thing in music—and indeed in all creative expression—is to elicit an emotional response in the listener, the beholder. An exciting and impressive performance, but one with little depth of honesty of expression, will soon be forgotten. But the Brahms came first! Wagner must have heard the Concerto, op. 15, which received its first performance in 1859. Is it possible—even probable—that Wagner recognized something special about the passage in question and jotted it down in a sketchbook perhaps? He probably had already begun writing Parsifal, which took him 30 years to complete. As is usually the case with such moving moments in my experiences with the Met Orchestra, by the time the concert rolls around, I retain the feeling from that special moment in the rehearsals, but the tears disappear, and I am finally able to see the music. Here’s the thing: Old time radio broadcasts especially, but even the old telecasts by their very nature, somehow provided a greater vent to our imagination. Today recorded sound and video have advanced to such a degree of clarity and “accuracy” that there is less room for the imagination.